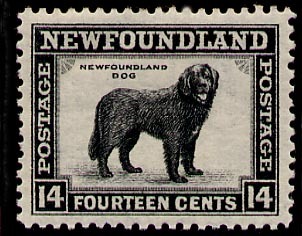 The flag of Newfoundland was adopted by its legislature in 1980. It was designed by Christopher Pratt, a Newfoundland artist/painter. 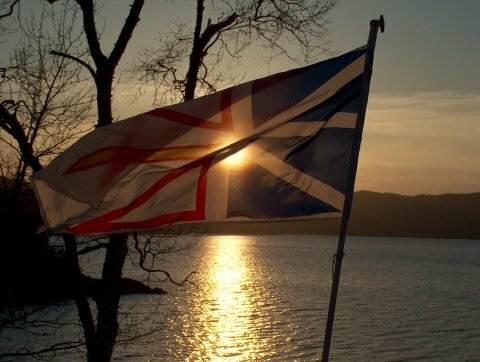 There was much controversy associated with the introduction of the new flag: the meaning of its elaborate symbolism was not easily grasped and it replaced the Union Jack that had been used officially as the flag of Newfoundland for several generations and under which several thousands of Newfoundlanders had fought and died in two world wars. 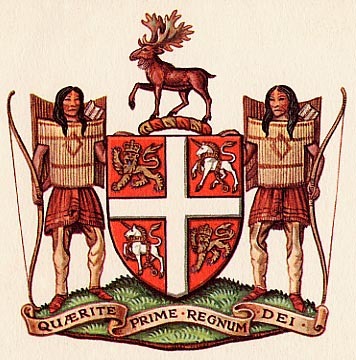 By diverging so significantly from the former symbol of the province, it seemed a denial of a fundamental characteristic of Newfoundland: its British heritage. However, as was the case with the new Canadian flag that also faced stiff opposition at the time of its introduction in the 1960's, the people have become accustomed to the flag and have reconciled themselves to it. The flag of Newfoundland is now flown proudly on many buildings throughout the Province.